No kitchen cupboard is complete without at least one bottle of Tabasco sauce. Now that spring/summer is fast approaching, with it shouldn’t come dreary attitudes about healthy food preparations. The Heirloom pepper, which is used to make the famous Tabasco sauce, allows you to get creatively adventurous in the kitchen with its flavourful palate offering. Now that it’s everyone’s favourite season, we think you should turn this Tabasco inspired salad into a lunchtime or dinnertime favourite. 1. In a food processor, combine all ingredients except the blended oil and Parmesan cheese. Blend the ingredients until they are combined and smooth, about one minute. 2. Keep the food processor going and slowly add in half the oil to emulsify the dressing. Stop the machine after half of the oil has been added to make sure the mixture is thickening. Continue adding in the rest of the oil until the dressing is thick. 3. Add in grated Parmesan cheese and pulse to combine. Taste the dressing for seasoning; it should have a nice, sharp kick from the Tabasco sauce. 4. This recipe yields approximately 600ml dressing. 1. Remove the core from the Romaine heart by cutting off the bottom piece. With your knife, split the Romaine heart in half lengthwise and then cut across to create squares of Romaine. 2. In a large bowl, add the chopped Romaine and dressing, and massage the dressing onto the Romaine with clean hands. This is the best way to ensure the salad is dressed evenly. 3. Add in croutons and toss lightly. 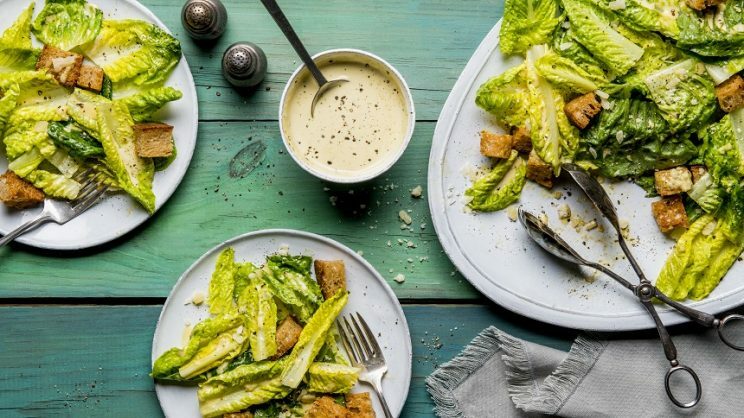 Serving suggestion: Pile the greens and croutons into serving bowls and grate more Parmesan cheese on top. Add a crack of black pepper from a peppermill and enjoy!